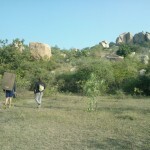 It’s time to go to Hampi folks! 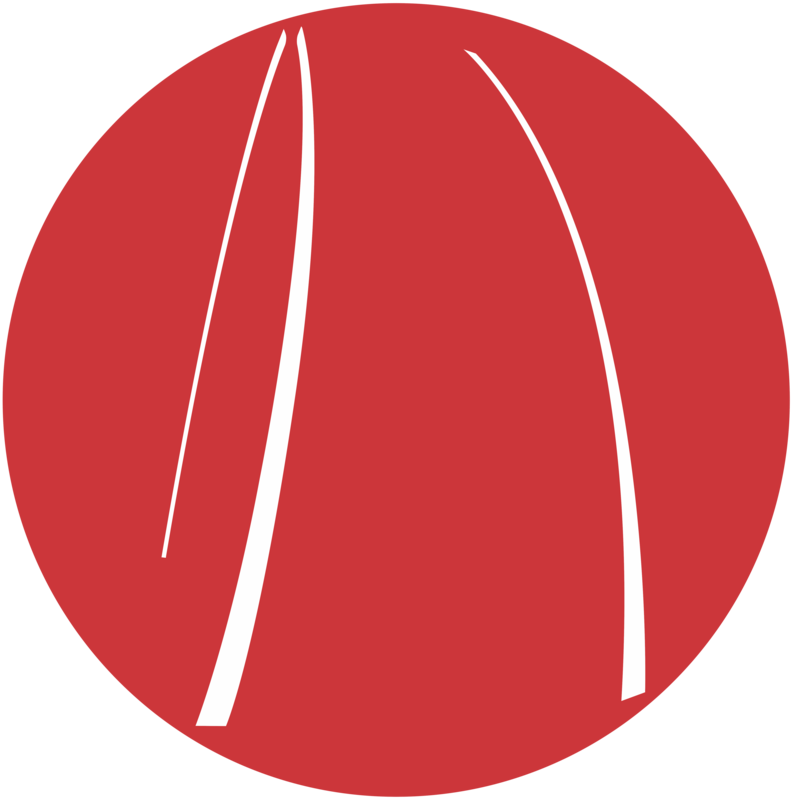 We thought we’d create a page listing all of the beta we had from last year, so that folks can contribute to it, and help organise their trips this year. We’re working with Project Rockface on this trip, so that climbers going from Delhi have the best information on Hampi we can provide. We’re also using Facebook to help share information on this year’s trip, so please head over to the event page if you’d like to take part. There are train options, but you’d have to expect to spend over 36 hours travelling, so time consuming and the usual hassles getting a ticket. We flew to Pune last time, but those flights are getting pricey, so we’d recommend flying to Bombay and then taking a bus to Hospet. The bus ride to Hospet is unavoidable, it’s pretty far inland, so people typically take a bus from Pune, Goa, Bangalore or Bombay. Hospet to Hampi is via auto, can fit three people with light equipment, price is Rs 200 one way. And then a boat which costs 20 rupees per person. 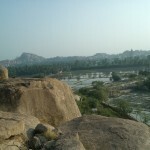 Hospet to Hampi is 14 km, approximately 1/2 hr. 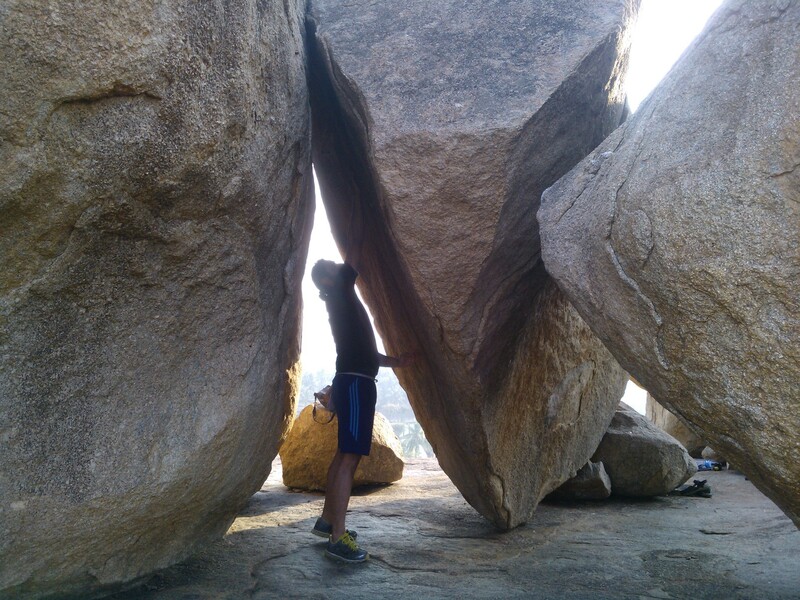 Given that it’s about 20 hours travel time each way, and takes a good week to get used to the exceptionally sharp granite that is found at Hampi, you should plan on spending at least 10 days, ideally 2 weeks for your first trip. The Goan Corner is super popular, it’s generally regarded as the place where most climbers will stay. They don’t really take reservations, and offer a couple of dormitory style options which are very affordable. 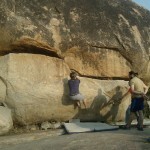 Their rooftop accommodation is perhaps the best spot in Hampi to meet other climbers. Contact Sharmila, 94482 12621. Manju Guest House is where we stayed last year, and we’d also recommend it. Contact 94492 47712 and 85332 87003. 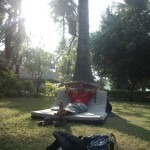 Rs 1200 per night for a room, and Rs 150 for sharing the roof and getting a cot. Free wifi, electricity is intermittent. Charging appliances wasn’t that easy due to power cuts. Food cost was approximately 500 per person per day for 3 meals. Food is pretty fantastic. There are mosquito problems at night, so bring along insect repellant. The hamlet is not lit, so you’ll want to have headlamps. 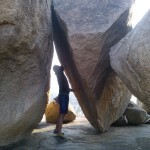 There are two prevailing guide books on Hampi, it’s India’s biggest and best documented bouldering area. We have copies at the gym we are happy to lend out for the trip, you can also purchase your own at Adventure18 in Satya Niketan. Crashpads can be rented at Hampi, charges per day depending on the kind and brand will range from Rs 50 to Rs 200. There’s a well known climbing shop called Tom & Jerry’s, which will offer you gear, chalk, etc. 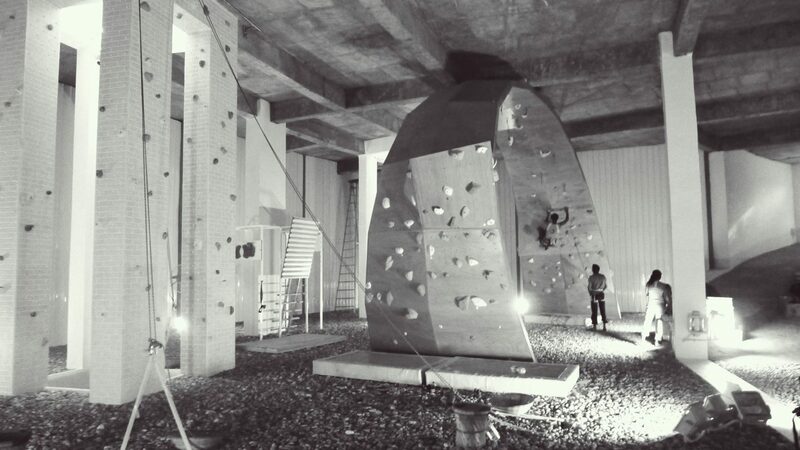 Climbing times are morning and evening, 7 am to 11 am and then 4 pm to 6.30 pm. It is hot during midday, and people climb after dark with headlamps. The season is December through February. Climbing grades go from 4a to 8b+, but feels harder, rock is very crimpy and sharp, hurts fingertips until a few days of adjustment. 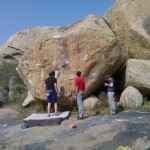 It was hard finding 5s and lower though, so we recommend getting to comfortable 6s to really enjoy Hampi. The river is nice and clean, there is also a dam four kilometres away where you can swim and cliff dive. You can hire motorbikes for Rs 150 per day and a cycle for Rs 50. Historic sightseeing is very nearby, the capital of the Vijayanagar empire. You can easily spend a week just sightseeing, absolutely world class heritage site.